Professor Layton and the Mask of Miracle (レイトン教授と奇跡の仮面 Reiton-kyōju to Kiseki no Kamen) is a puzzle video game for the Nintendo 3DS. It is the fifth game in the Professor Layton series, but the third story chronologically. The game is a prequel to the series, set after Professor Layton and the Specter's Flute, and continues the story of the search for Jean Descole. the game has received a visual and gameplay overhaul since its jump to 3DS: the typical hand-drawn 2D sprites have been replaced by 3D models of the characters; the player can now examine areas in a 3D perspective; and some puzzles now take advantage of the 3DS' unique features, such as its motion sensor. Despite its new visual style, the series' iconic animated cutscenes remain intact. Professor Layton and Luke head to the town of miracles, Montdol in search of the Mask of Miracle. The mask has the ability to grant wishes to its wearer. 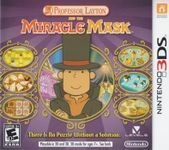 Layton and Luke arrive at the town to see they are too late, as a mysterious man is using the power of the mask to turn people to stone. Its up to Layton and Luke to solve the mystery of the town. The truth is hidden deep inside the Mask. Source: Wikipedia, "Professor Layton and the Mask of Miracle", available under the CC-BY-SA License.